Norwegian has been awarded ‘Airline of the Year’ at the 2017 CAPA Aviation Awards for Excellence during the CAPA Global Aviation & Corporate Travel Summit in London. 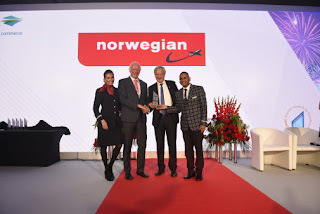 Norwegian CEO Bjørn Kjos, was presented with the ‘Airline of the Year’ award by CAPA Executive Chairman Peter Harbison during a gala dinner at the Sofitel London Heathrow. Bjørn Kjos, CEO at Norwegian said: “It’s an honour to collect the award for CAPA Airline of the Year on behalf of Norwegian. “This achievement underpins the hard-work and support of all my dedicated colleagues who have contributed to Norwegian receiving a prestigious industry recognition once again. “In our 15th year, I’m proud to see Norwegian’s combination of affordable fares, fuel-efficient aircraft and high-quality service recognised by our industry peers. Peter Harbison, Executive ChairmanCAPA – Centre for Aviation said:"Through a combination of new technology, regulatory change and applying innovative strategies, Norwegian has irreversibly reshaped the way airlines, low-cost and otherwise, look at their network opportunities. The number of airports that fight for each additional aircraft that joins its fleet show the value of the Norwegian model to the aviation sector for short and long-haul flying. The demand is there and hopefully profitability will follow as Norwegian truly develops from its roots as a European regional airline into a global airline and recognised brand across the world. These global ambitions are exemplified in recent route expansion to Singapore and into the Argentine domestic market."